Grand Cherokee SRT owner says she wasn't told the $2,500 extended warranty was bogus. 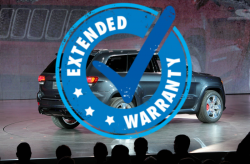 January 26, 2019 — A vehicle extended warranty lawsuit alleges a Jeep Grand Cherokee owner paid about $2,550 for a "useless" warranty that left the customer paying thousands and thousands of dollars for repairs she thought would be covered. Plaintiff Grazyna Nowak filed the lawsuit against WS Aftermarket Services Corporation and Warranty Solutions Management Corporation for selling her an extended warranty that couldn't legally be used with her 2014 Jeep Grand Cherokee SRT. In April 2016, Nowak and her son Adam Zakamarek went to EMG Auto Sales Inc., in Avenel, New Jersey, and looked at the Grand Cherokee SRT with about 20,000 miles on the odometer. Mr. Zakamarek test drove the Jeep which appeared to operate normally and EMG’s finance manager allegedly said the Jeep still had the manufacturer’s original powertrain warranty. The plaintiff and her son left the dealership but returned the next day to purchase the SUV, allegedly asking if a third-party extended warranty could be purchased. EMG allegedly said a WS Aftermarket Service Corporation service contract could be purchased and administered by Warranty Solutions Management Corporation. According to the lawsuit, the extended warranty contract was signed by the EMG finance manager but not by the plaintiff. The plaintiff took possession of the Jeep on April 16, 2016, after paying $2,550, plus tax, for the extended warranty contract. Nowak says she received a letter from Warranty Solutions dated September 23, 2016, confirming her purchase of the service contract, but in November an indicator light (P0305) illuminated on the instrument panel. Mr. Zakamarek says he took the Jeep to a local Jeep dealership where the service advisor said the manufacturer's warranty was no good because the Grand Cherokee SRT was manufactured to be registered in Canada, not the U.S.
Zakamarek says he then called the extended warranty company but was allegedly told the company wouldn't provide warranty coverage because the Jeep was built to be registered in Canada. Warranty Solutions allegedly told the plaintiff to seek a refund from EMG, the company that originally sold the Jeep to Nowak. However, on November 21, 2016, the Jeep engine allegedly seized while on the New Jersey Turnpike, leading to a $305 towing charge to get the vehicle to a Jeep dealer. According to the extended warranty lawsuit, the Jeep allegedly continues to have transmission problems and the plaintiff says she has been told the job will cost more than $8,000. In addition, the carbon fibers have allegedly dislodged and need to be replaced at a cost of more than $4,700. The plaintiff says WS Aftermarket Services Corporation and Warranty Solutions Management Corporation should have never sold her a useless $2,500 extended warranty for a Jeep that was not manufactured to be sold in the U.S. The vehicle extended warranty lawsuit was filed in the U.S. District Court for the District of New Jersey - Grazyna Nowak, v. WS Aftermarket Services Corporation and Warranty Solutions Management Corporation. The plaintiff is represented by the Wolf Law Firm, LLC.